. 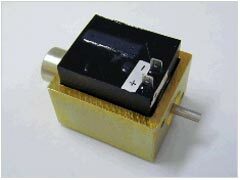 The solenoid can be supplied on a permanent basis with, on operate, the same performances as the 5% version solenoid.
. 2 TOR inputs can be programmed. :. On operate power requirement : 160 W. Maximum hold power requirement : 14,5 W :. See the curve of on operate stroke performance here-after (hold performance is 6 daN minimum). The solenoid can be supplied on a permanent basis with, on operate, the same performances as the 5% version solenoid.. 2 TOR inputs can be programmed.